There was the love of vintage and pinup for sure! But there was also a love of teaching, books, baking, and cosplay! I needed to find out how it all worked together and perhaps learn her secrets for managing a busy life. Like so many of us, it was through her family adventures to antique shops and baking with her grandmother that started her passion for old things. But she didn’t find her passion for pinup competition until she moved to Brisbane and was looking for a way to build her confidence and make new friends. We hear it over and over again on the podcast. How the vintage community around the world can build us up, introduce us to people who challenge us and help us grow and help us embrace the vintage guys and dolls we really are. The experience, both good and bad moments, was the same for Mel and while she doesn’t compete anymore is a 24/7 vintage vixen! But I was also interested to read about her passion for Cosplay. I’m a nerd, but the Cosplay scene has passed me by and I really do associate it with the big conventions in the United States so I was so keen to learn more. Having seen Mel’s posts on her instagram and facebook pages I was interested to see how pinup and cosplay works together. And it does! Almost perfectly. It’s like one is the extension of the other. As well as pinup and cosplay Mel is a writer and helps others by using her skill with words to write bios and books. She teaches the next generation of Australian writers at a university in QLD and is the master of puns for burlesque bios! Oh and she has the sweetest rescue dog Archie! 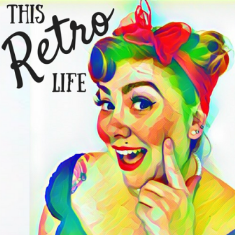 You can meet Mel in our latest episode of This Retro Life and find out more about all of her passions and work on her brand new website!